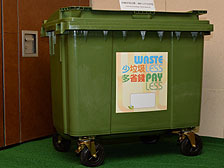 Seven housing estates will participate in a pilot scheme for municipal solid waste charging, Secretary for the Environment KS Wong announced today. Amoy Gardens, Chai Wan Estate, Chun Seen Mei Chuen, Island Resort, Kwong Tin Estate, Tak Tin Estate and The Orchards will join the trial, with a combined 10,000 households in 22 towers. The estates will test three charging models - weight-based by building, with a suggested mock charge of $500 per tonne, volume-based by building at $66 per 660-litre bin, and volume-based by household, at 10 cents a litre, for five-, 10- and 15-litre bags. 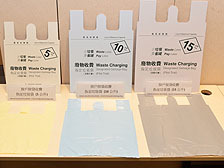 Waste not: Bags for the volume-based household charging model will come in five-, 10- and 15-litre sizes. Rubbish reduction: A 660-litre refuse bin for use in the trial of volume-based charging by building option. The Environmental Protection Department will conduct a one-month baseline study at each estate between April and June, to determine current waste-disposal levels, followed by a five-month trial period . The average household disposes of .88kg per person per day, so a three-member household would expect to pay a monthly mock charge of about $40. Implementation details, including charging levels, will be adjusted after studying a report on the pilot scheme, Mr Wong said. "The pilot scheme will allow us to accumulate practical experience for the various charging options and identify the difficulties and challenges for reference when we draw up the final way forward,” he added.